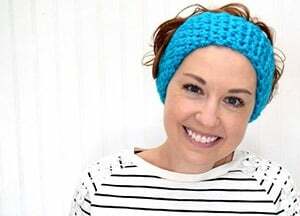 Thanks so much to Lion Brand yarn for supplying the yarn for this project and supporting our Crochet Along! 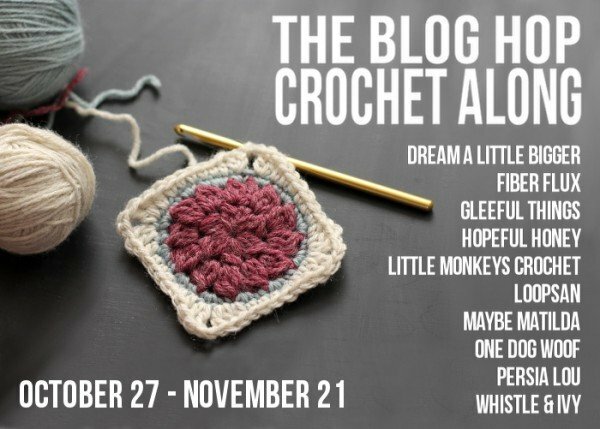 Today I am excited to be joining The Blog Hop Crochet Along! 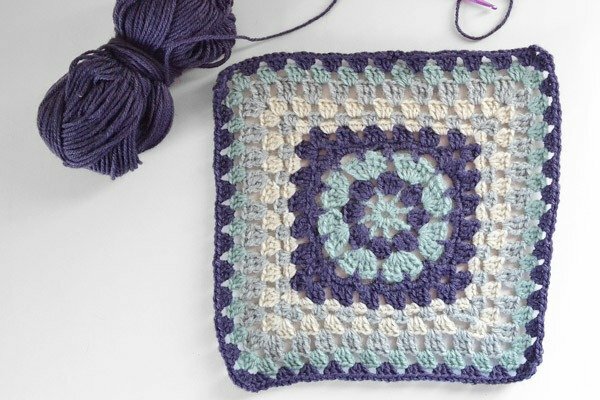 Nine other bloggers and I are teaming up to a new afghan square pattern every day for a month. Crochet along with us and you will have a gorgeous new afghan just in time for the holiday season! Every day (M-F) a new square pattern will be posted on one of our ten blogs. You can join in the fun by crocheting each day’s square on that day whenever you have time. Share your progress and post photos of your squares in our facebook group. 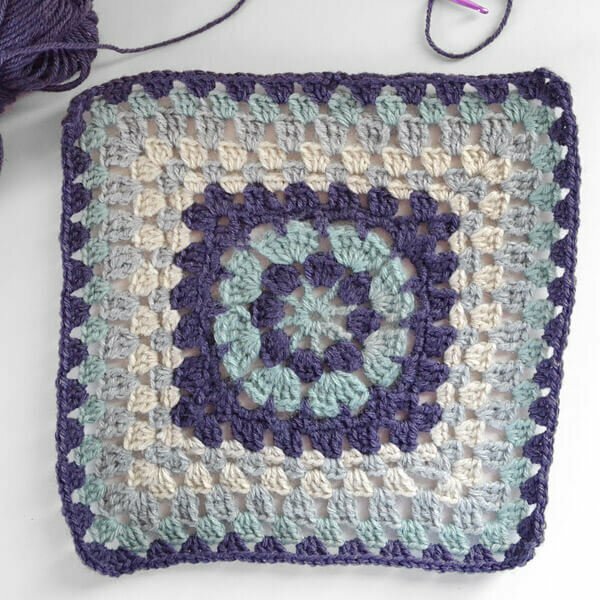 By the end of the Crochet Along you will have twenty 12″ squares all ready to be pieced together into a beautiful afghan just in time for the holiday season. Finally, we will be hosting some fabulous giveaways! You could win Lion Brand yarn to make your own afghan, $100 CASH money, OR our COMPLETED AFGHAN! That’s right, we are going to be piecing all of our squares together and shipping an afghan out to one very lucky winner. 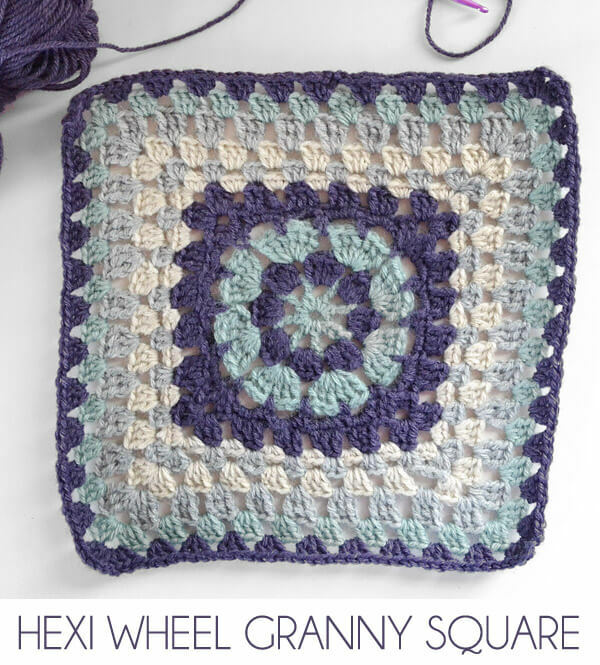 Today I am sharing the Bobble Floral Granny Square. You can find links to all the other patterns at the end of this post. The links will be updated daily! At any rate this is my second of two squares for this amazing afghan and crochet along and I’m super excited to have been invited to participate. So thanks everyone and Lion Brand! Now this is my SECOND written pattern and there were a few issues with the first, which through the power of Facebook and kind hookers I was able to update so that it was less a mess and more functional. I am hoping *fingers crazy crossed* that this one is a good one. BUT if you have any issues let me know in the comments or by email or however you’re comfortable <– thanks in advance. Chain 6. Join with slip stitch to form a ring. Round 1: CH 4. TR 7 into the center. SL to join. Round 2: New color. CH 3. DC 3 into gap and CH 1. DC 4, CH1 in all gaps. SL to join. Round 3: Color 1. CH 4. TR 5 into gap and CH1. TR6, CH1 in all gaps. SL to join. Round 4: Color 2. Starting in gap CH5. SC in middle of 6TR from previous round. CH 5 SC in gap. Continue around SL to join. Round 5: CH 3 into SC from previous round. DC 1 and CH3 DC2 and CH1 (forms corner). *SC 3 into next 4 gaps with DC 1 and CH3 DC2 and CH1 for corner. Repeat around SL to join. Round 6: Start in corner. CH 3, DC 2, CH 3, DC 3, CH 1 (forms corner).DC in next 3 stitches from previous round, CH1. Continue to corner then CH 3, DC 2, CH 3, DC 3, CH 1 and repeat. SL to join. Round 7: New color. Continue like traditional granny using single crochet. In gap CH1 SC 2 CH1. *SC3 and CH1 in gaps along straight edges. In corners SC3 CH3 SC3 CH1. Continue around SL to join. Round 8: New color. Continue like traditional granny using half double crochet. In gap CH1 HDC 2 CH1. *HDC3 and CH1 in gaps along straight edges. In corners HDC3 CH3 HDC3 CH1. Continue around SL to join. Round 9: Color 3. Continue like traditional granny using double crochet. In gap CH1 DC 2 CH1. *DC3 and CH1 in gaps along straight edges. In corners DC3 CH3 DC3 CH1. Continue around SL to join. Round 10: Color 4. Continue like traditional granny using treble crochet. In gap CH1 TR 2 CH1. *TR3 and CH1 in gaps along straight edges. In corners TR3 CH3 TR3 CH1. Continue around SL to join. Round 11: Color 1. Continue like traditional granny using double crochet. In gap CH1 DC 2 CH1. *DC3 and CH1 in gaps along straight edges. In corners DC3 CH3 DC3 CH1. Continue around SL to join. Round 12: Color 2. Continue like traditional granny using double crochet. In gap CH1 DC 2 CH1. *DC3 and CH1 in gaps along straight edges. In corners DC3 CH3 DC3 CH1. Continue around SL to join.